God I have had such a good weekend! It's been the perfect mix of busy and chilled. After work on Friday I got the train down to Wolverhampton to meet Steph and go see Matchbox Twenty. When we first talked about going neither of us were sure if the other was joking but we were both completely serious. And they were absolutely incredible. Probably one of the best gigs I've been to in a long time. Why are they not more popular seriously? I've spent the last 3 days listening to them non-stop, especially "Bent" which I have been listening to on repeat! Rob Thomas' voice is just gorgeous (fun fact- remember when I did karaoke in Nashville? I sung Smooth by Santana and Rob Thomas). Anyway, after the gig we headed back to Birmingham to meet our friends for a night out, bought cans of cocktails from Tesco and drank them on a park bench in Birmingham city centre (classy, right?!) and had an awesome night out at Snobs. Then the best part of going out on a Friday instead of a Saturday was it was like getting two Sundays! Saturday was spent back in Selly Oak saying goodbye to our favourite university pub which is being knocked down in a few months, getting excited about going back onto the University of Birmingham campus and catching up over coffee. I can't express how much I love my uni friends and it's so hard not seeing each other as much as we did when we were at uni together (aka, every day!) but it's so great when we get a chance to meet up. I really appreciate how amazing they are. Sunday has been spent doing normal Sunday stuff- food shopping, going seeing family (I bought these boots with a gift card my auntie gave me so I co-ordinated my outfit around them so I could show her them! ), prepping for food the week and bingeing on Netflix. We also had the added treat of a meal out tonight as our family friends were up here before their flight from Manchester airport tomorrow. It's felt like I've had an extra long weekend with going out on Friday, which is always a plus. Now back to my Arrested Development bender! Hope your weekend has been great! I'm a big Matchbox Twenty fan Charlotte. Saw them in 2007 (maybe 2008 :/ ) at Wembley Arena! Love your outfit! Matchbox 20 is awesome! I met them a few times and they are one of the nicest bands ever. Your site is very nice about latest nice dressing. I like your post keep it up. You look so perfectly cool here! 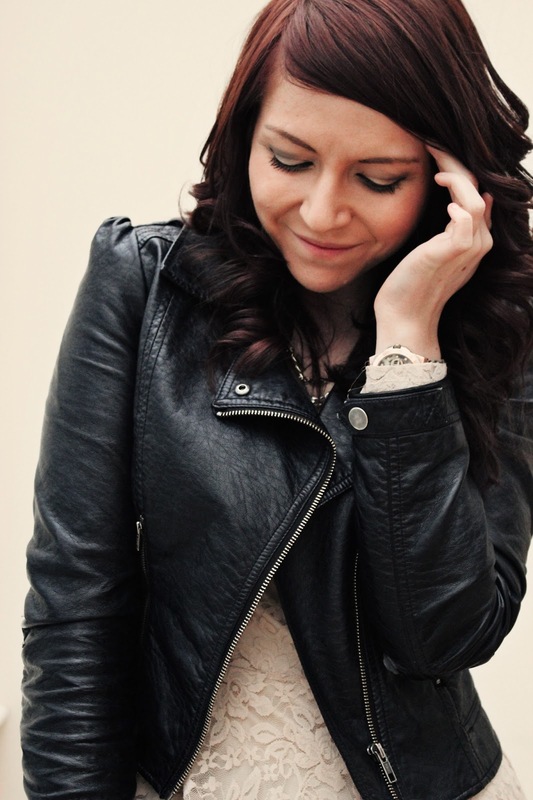 I just love the lace dress paired with your leather jacket. Your weekend sounds like it was pretty awesome too!